We Copples have continued to nurture and teach children from one township at Master Peace Academy, as well as working with three after school kids clubs. One of the clubs turned into something special in the Avian Park township. It wasn’t sustainable to run a large kids club, so we trained eight teenage girls to be leaders using the Mailbox Club curriculum for younger kids. We disciple these girls on Saturday afternoons. The above picture shows Tony leading worship with many of them while Laurie-Ann was making them sandwiches. They often join us at church and for other events. This has gone far beyond just training them. They are beautiful and compassionate leaders with the children under their care! The picture below shows Marsha (one of our girls) teaching children under the shade of a tree. Marsha is being counselled for witnessing gangster violence, yet she still has a wonderful heart of mercy towards children. While we miss many of the younger Avian Park children, we still work with the Riverview township children on Wednesdays. We’ve been invited to join them on a nature retreat soon, and hopefully Laurie-Ann can share an art session with them. This is the only group that L-A has not been able to share art with, due to them meeting in an outdoor courtyard. Wind, rain, heat and cold combat our time with them, but we remain persistent. We also are still involved with the farm kids club, run by Iris Western Cape base. We have new South African leaders who speak Afrikaans – the children listen to their every word! We are thankful to work with and learn from them. The picture below shows Sergio, one of the younger Riverview boys. He insists on sitting on the table portion of Laurie-Ann’s chair. He’s just under the weight allowance (10 kg). Sometimes we reward our teens with special days. In September it was an outing to the nearby Karoo Botanical Garden. In December we had a pizza party and gave the girls their very own pink Afrikaans bibles and handmade denim bags to hold them. In February we had a baking party, while watching the movie Annie (by popular request). That very day two YWAM-trained counsellors took three of our girls into our office and bedroom to counsel them for issues related to family strife and gang violence. One of the girls (Bonnie) was in protective custody, due to her mother being assaulted by her step-dad. Tony is working in pastoral care with Bonnie, her siblings, and grandfather; he is working to reunite the family, since the step-dad is now in custody. We are glad that Bonnie has had wonderful times with us where she can laugh and learn. She was one of the ones who enjoyed baking brownies with Laurie-Ann in the picture below. Laurie-Ann continues using art to bless children. She teaches art in Master Peace Academy (a challenge with younger students this year), and shares with kids clubs about prophetic art. Then the children get to colour in some of the images that will be in a future colouring book. We were asked to join our local church’s Kinderkerk for two weeks in December. The first week they coloured. The second week they were encouraged to listen to the Holy Spirit and draw their own art. The head of the Sunday school wants to bring Laurie-Ann into other venues with her art. Laurie-Ann has also been invited to consider the possibility of sharing this kind of art with Worcester Primary students. Both Tony and Laurie-Ann have been given other opportunities to bless others. Tony is a weekly pastoral care visitor in a local hospice, and is part of a savings club called GIG. He has a heart to teach savings and budgeting to cash-strapped township folk, which are taken advantage of by pay loan companies. Tony is also recording an audio version of Jasper Cloete’s book, Legacy. This is the book that the GIG club is based upon. Laurie-Ann is also heavily involved with bookkeeping for Change Makers, which has freed up the people who run that ministry for more rehabilitation projects and devotional time with Jesus. We continue to run Alpha in nearby Brandvlei prison on Saturday mornings, although after we spent eight months with the medium security facility we were asked to switch to the youth offender unit. Apparently the people that we are leaving want us to return ASAP, because we ministered to more than the inmates. The wardens also receive love and pastoral care. Oh that we had more time to spend with them! Much of our time centres on our school, Master Peace Academy and the ministry in Avian Park, and we’ve been advised that we need to slow down, not speed up. We continue our CWCP internet radio broadcasts where Tony interviews different ministry leaders for our Worcester Reports show. L-A includes her Ways to Grow in God devotional segments, and often we have audio clips of children singing. You can find podcasts on the CWCP page on our website, coppleswesterncape.ca, under the ‘Listen’ dropdown. If you by chance you would like to sample these podcasts, we recommend the two by ex-gangsters turned evangelists, Marco (July 26, 2018) and Ebrahim (March 14th 2019). In December we took a six day break to the West Coast of South Africa, discovering wildflower country, natural fynbos honey and rooibos. We also were able to find a rare Christmas turkey, so we celebrated Christmas with some of our local Iris family in our home (which included Kaysha and her then fiancé, who left our base to marry a Rwandan pastor). We have more vacancies at our base, as well as in both the Robertson and Worcester Iris clusters. After that, Laurie-Ann endured two months of illness (boils, carbuncles, rashes) that gave Tony a run at nursing Laurie-Ann. After multiple-rounds of antibiotics, painkillers, tests and colloidal silver, most of the skin ailments have been conquered, while slowly working on bookkeeping, teaching and discipling teens. We have a new understanding of Job’s experience, and it’s quite humbling. Some of the girls decided to walk up to our home to “stop for the one” and bless Laurie-Ann. They didn’t ask for food, although did get a ride home! They just wanted to see Laurie-Ann and to pray for her. 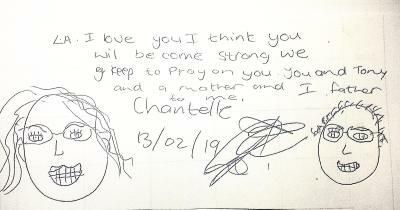 One of the girls (Chantelle) drew us a little cartoon. We are so happy that these girls are part of our legacy to Worcester. We are coming back to Canada for a home visit (furlough), and arrive in Ottawa on May 30th. We are staying in different venues, from friend’s homes/cottages, timeshares, rented basement apartments and airport hotels. We’re having a challenge finding a car, but we expect we will find one soon. We are open to speaking (especially to small groups) and we do have a Sunday or two available. Our 20th wedding anniversary (June 18th) will be celebrated at One Way Ministries in Ottawa, where we will have a drop-in time where friends can connect with us. We also plan to be in Williamsburg, Virginia for a week (at a timeshare), so that we can visit Laurie-Ann’s 'Iris papa' who leads the Iris-affiliated Dwelling Place church in Richmond, and other friends as well. If you’d like to see the Copples, please visit our events page at https://www.coppleswesterncape.ca/events. We would be happy to fit in a few more visit times if you’re in the area. You can track our progress on http://www.coppleswesterncape.ca, including a daily journal and blog. We are on Facebook as Copples in Western Cape (as well as Twitter and Instagram). Tony also has a Flickr account with many photo albums (https://www.flickr.com/photos/97690335@N02/sets/), and a YouTube account (https://www.youtube.com/user/TonyCopple1/videos). We invite you to join our newsletter emails by emailing Laurie-Ann at kootenaysprayer@gmail.com.